Today’s “Card of the Day” features a future butching mantis. [AUTO] Dark Device (Active when your opponent has no [Stand] units in the same column as this unit):[Counter Blast (1)] When this unit is placed on (VC) or (RC), you may pay the cost. If you do, choose one of your opponent’s rear-guards in the same column, and that unit cannot [Stand] during your opponent’s next stand phase. 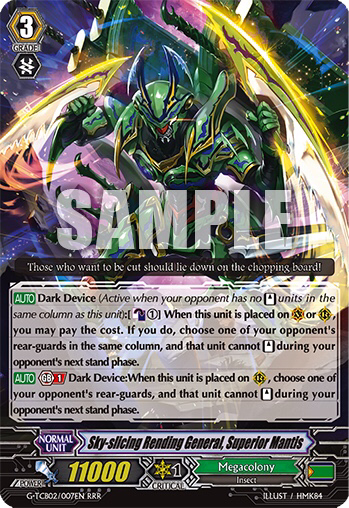 [AUTO] Generation Break 1 Dark Device:When this unit is placed on (RC), choose one of your opponent’s rear-guards, and that unit cannot [Stand] during your opponent’s next stand phase.